Tulane Tennis finished their fall seasons this past weekend with high finishes in their last two competitions. The Green Wave will start up their spring seasons in late January. 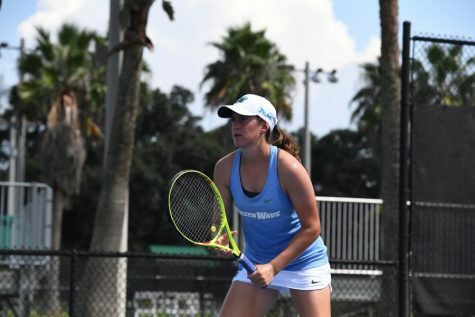 Facebook Caption: Following their short periods of fall competition, Tulane men’s and women’s tennis teams have seen quite a bit of recent success. Hear more about their successes and struggles here! With the end of the semester just around the corner, fall athletic seasons are coming to a close. Both the Tulane men’s and women’s tennis teams wrapped up their fall competitions this past weekend, Nov. 9-11, and will have over a month break before facing their next opponents. Here is a look at how both teams fared this preseason. The women’s team has competed in three tournaments since the last check-in, making it a total of four for the semester. At the Roberta Allison Classic hosted by the University of Alabama on Oct. 26-27, the Green Wave gave its all. Junior duo Ivone Alvaro and Laura Fabrizi defeated not one, but two pairs of Southeastern Conference opponents to bring home the competition’s doubles crown. Sophomore Alex Alegre and freshman Adelaide Lavery found similar success, winning the consolation doubles. The following weekend, the team traveled to Lexington, Kentucky for its third tournament. Not quite able to match its success in Alabama, Tulane split a pair of doubles matches. After taking two of three matches against Virginia Tech University, the Green Wave was unable to find any victory against the University of Kentucky. With four out of six wins in singles matches the following day, however, the team was able to end on a high note. At the Florida State University Invitational, the team’s last competition of the semester, sophomore Daniela La Fuente stood out for Tulane, taking home third place in the consolation competition. The rest of the team struggled, unable to finish out the semester with a victory. The team announced its spring schedule in October. The ladies have 15 home and eight road matches ahead of them, including five opponents that reached various stages of the NCAA tournament last year. Additionally, the team has welcomed volunteer assistant coach Michael Johnson, a graduate of Tulane University School of Law. The Tulane men’s tennis team had an impressive run this fall, with players competing in a total of 11 tournaments. Most recently, the Green Wave sent players to the Oracle/ITA Fall National Championships in Surprise, Arizona and the Longhorn Invitational in Austin, Texas. Juniors Ewan Moore and Luis Erlenbusch qualified for the fall National Championships this year. Moore, who was ranked No. 60 in the country in the ITA preseason rankings, won in the tournament’s first round, only to fall to fifth seed and No. 8 Thomas Laurent in the second round. Erlenbusch upset the national No. 11 player in the first round of the tournament, showing he is not to be underestimated. After also defeating the No. 94 ranked player, Erlenbusch fell out of the tournament in the round of 16. During this fall run, Erlenbusch has defeated 4 of the 5 top-100 opponents he faced, despite not being ranked himself in the preseason rankings. In Texas, Tulane closed the semester well-off at the Longhorn Invitational. Juniors Dane Esses and Tim Ruetzel swept their two-set matches, bringing home the consolation singles title for the B class and third place in B class main draw, respectively. This strong preseason performance is good preparation for the spring, when the team will be looking to repeat, and possibly surpass, its success of the 2017-18 season. The women will resume play on Jan. 19 against Northwestern State University, while the men will face Alcorn State University on Jan. 21 before taking on the University of Tennessee in the ITA Kickoff on Jan. 25.